Mineral makeup has never proven more beneficial as the summer heat piles on and hot, sticky perspiration becomes the norm. However, there always seems to be the pesky zit that keeps popping up or simply won't go away. You know the one, that shiny red bump that hangs out on the forehead, around the nose or under the eye, at the top of the cheek, lasting for days or even for a week or more. Even when using your mineral makeup, some of us get several at a time in the same location, but the results are always the same, they just seem to keep hanging in there. It is this time of year, more than any other time of year, we need to be on our toes on keeping those pesky pimples in check. Exercise, working out in the yard, or just sitting under an umbrella in intense heat, all cause us to sweat on our faces. Whether it is beads of sweat or a downright dripping of perspiration, or maybe we just glisten ever so slightly. Either way, this all causes us to get that pimple that seems to stick around until our temperatures get colder and the air gets drier. When we do the things we love in the great outdoors, it is the things we do in the great outdoors that causes us the unrelenting pimple. Wearing hats, sweat bands, sunglasses, or simply not cleansing our faces post workout or extended periods of sweating. When we do these things, it blocks air flow to our skin and perspiration is allowed to sit against our faces, causing us the next pesky pimple to arrive. Sloughing skin cells become sticky in sweat and potentially block air flow to the pores of the face. Even waiting until bedtime to wash our faces after a long hot day, can cause acne to be troublesome. In addition to using your minerals, these very simple steps can help you to further control acne during the hot, summer months. 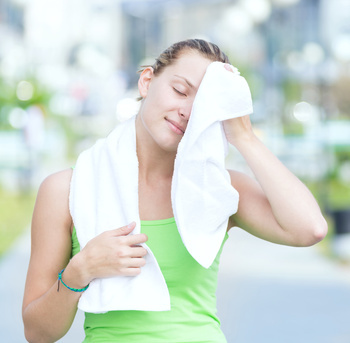 After exercise remove the sweatband immediately to allow the face to dry quickly. Then take a wet terry towel with cool water and flush and wipe the sweat from your face. Make sure wet, sweaty hair is also pulled up off the face. Take off your sunhat periodically, allowing air to get to the skin and wipe your brow with a moistened cloth. Try to daub some cool water on the face whenever possible in the areas of where the hat rested. Shift sunglasses up and down the bridge of the nose and remove them altogether, wiping away excess perspiration. This allows air flow to the nose and eye area where zits love to pop up and reside there forever. Do wear your mineral makeup. The minerals will help to control perspiration through their excellent absorbent properties, and you can still splash water on your face and daub, not wipe to keep cool, and your minerals will stay in place. Even if it is just one of our mineral veils because you may like to skip makeup days, they will help control perspiration, giving skin a better chance at avoiding the never ending zit. Do wash your face with ONATI Skin Care a minimum of twice per day, even if you skip makeup. Perspiration needs to be flushed and washed from the skin, taking all the oily, grimy, sticky sebum mixed with skin cells away and down the drain. Avoid cornstarch mineral veils since once they get wet they too become sticky, will shift on the skin, and will congest pores, creating more acne. These few simple steps can and will help fight and control that pesky zit or spot of pimples that seem to be never ending in summer.